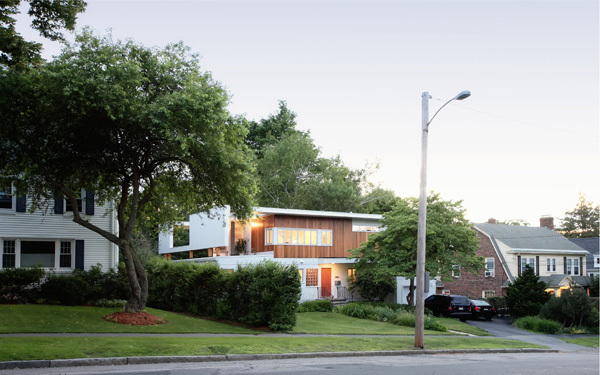 Mid-century modernism in New England attempted to bridge the modern and traditional, many times with indecisive results. Originally built in 1948, the latent potential of this house was unlocked by natural means – a large falling tree destroyed most of its second floor. The new wood-clad upper story incorporates natural lighting and ventilation strategies in conjunction with a new openness: an existing sense of enclosure on the preserved first floor is translated into thickened thresholds on the new second floor that allow both free movement and visual privacy. 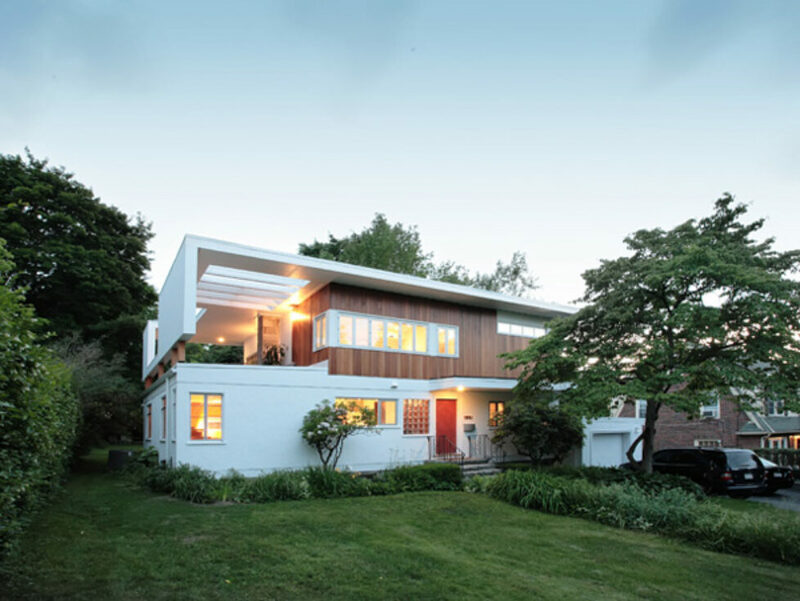 Horizontal windows and overhangs amplify moments from the original design while acknowledging the surrounding neighborhood’s scale. The existing building had been badly damaged in a storm and required considerable repair. SUN SHADING: The brise-soleil over the south-facing roof deck protects the space from the heat of the summer sun. 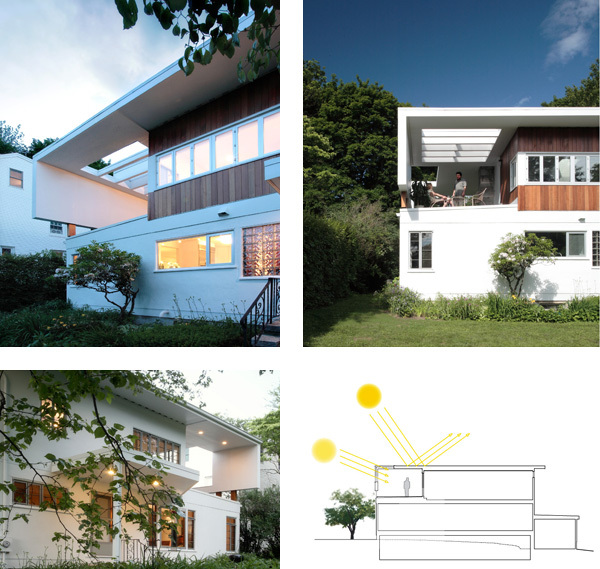 Openings are strategically located to allow light from the low winter sun to light the interior. 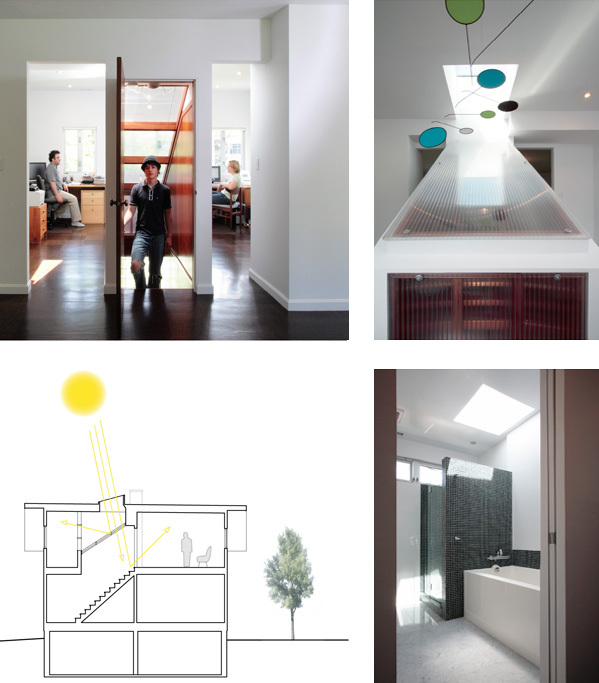 DAYLIGHTING: The ceiling of an interior stair is replaced by a translucent panel, allowing sunlight to enter upper and lower floors from a skylight above (top and bottom left). Sunlight is brought deep into the building instead of confined to a single space (bottom right). The house picks up the scale of the dense surrounding houses.